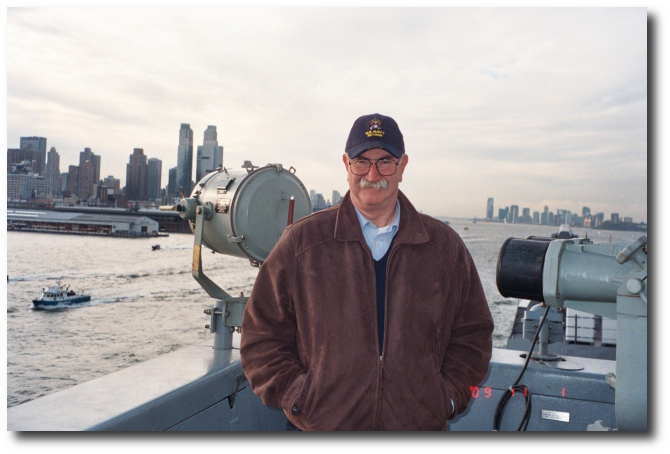 I had the honor recently to be invited by the USS New York Commissioning Committee and sponsored by Tiffany & Company to fly out to the USS New York on Sunday November 1, 2009 and ride her into New York City on November 2nd where this newest warship of the U.S. Navy was to be commissioned on November 7th. 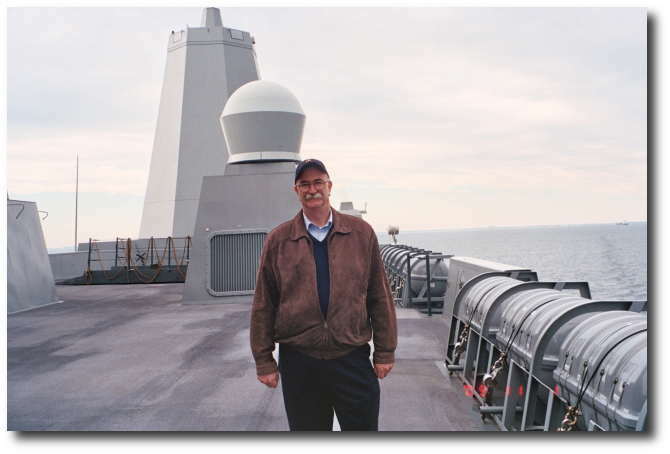 Here are some photographs taken November 1-2, 2009 while I was riding the USS New York (LPD-21) on her arrival voyage to New York City. The Navy flew us out on CH-46 helicopters from the Manhattan Heliport on Sunday the 1st to the ship which was operating at 4-knots within an assigned AOR near the Manhattan lighthouse. 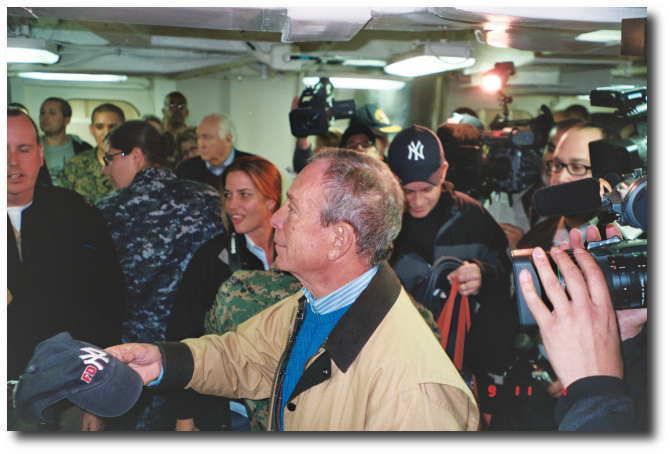 Later in the night hours, Mayor Bloomberg rode one of the ship's two LCACs (Hydrofoil landing craft) from NYC to the ship. The guests spent the night in one of the enlisted berthing areas. I had forgotten the night sounds of 50 or 60 men sleeping in one area. 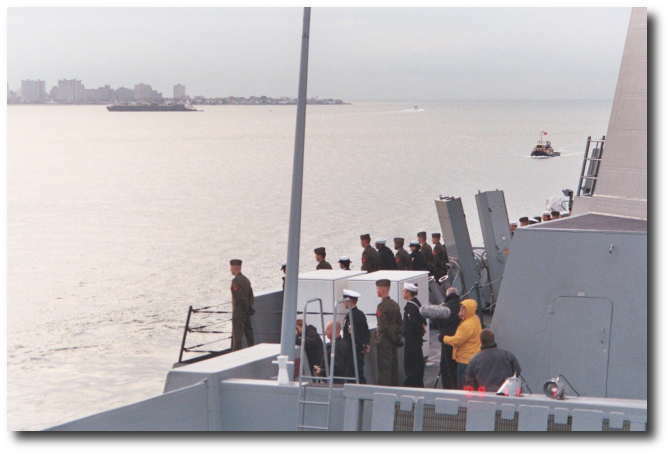 Then early Monday the 2nd, the USS New York turned the ship towards NYC waters. 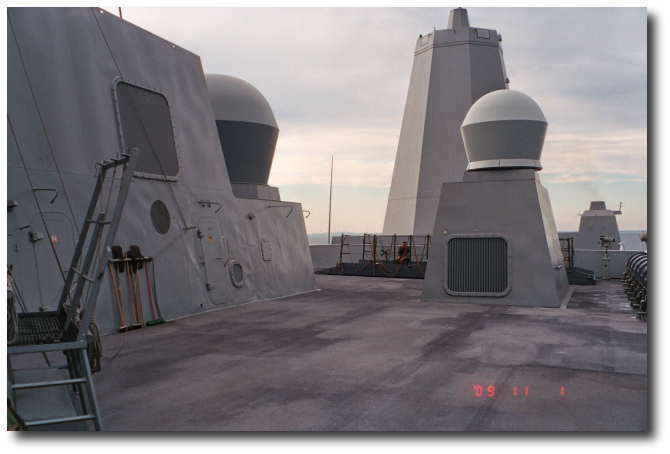 We had heavy security by NYC Police, Coast Guard, and NY State Patrol patrol boats and helicopters along with 50Cal and 40Cal machine guns loaded and manned on the ship. 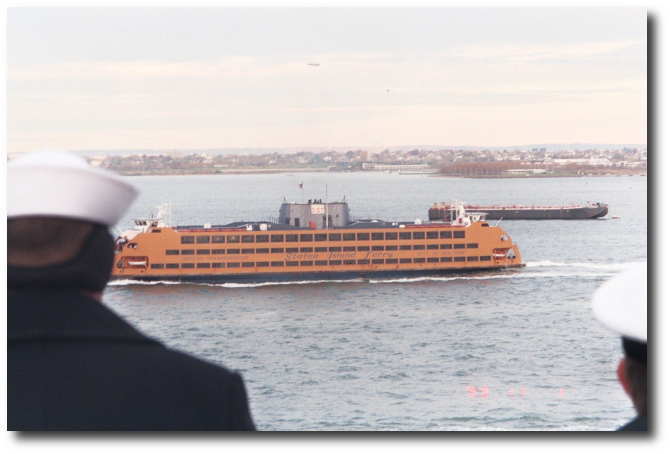 First ship to render honors to USS New York as she passed near the Statue of Liberty was the 'Staten Island Ferry.' The warship returned the honors, which I thought was a great way of recognizing the courtesy of the passing vessel and a salute to the citizens of New York City. 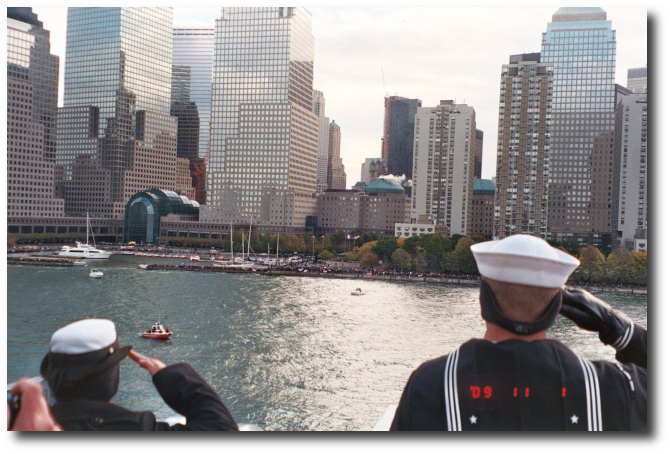 Soon thereafter, the warship encountered several fire fighting vessels spraying bouquets of red, white, and blue waters between the Manhattan shoreline and the Statue of Liberty as we passed. 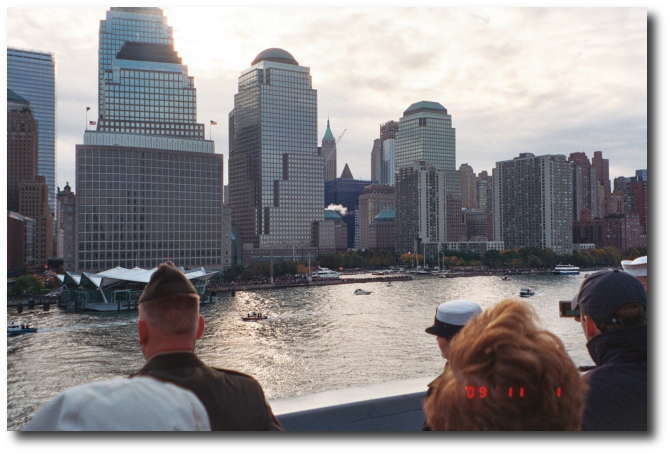 Once the USS New York arrived opposite the WTC Site she heaved-to and the Marines fired a 21-gun salute with M-16s. Originally, I understood the ship was going to use its saluting battery, but there was concern that the sound of artillery fire echoing over NYC might alarm those who were unaware of the event. The 21 gun salute was an emotional moment as it brought back memories of being at the Pentagon on 9/11. 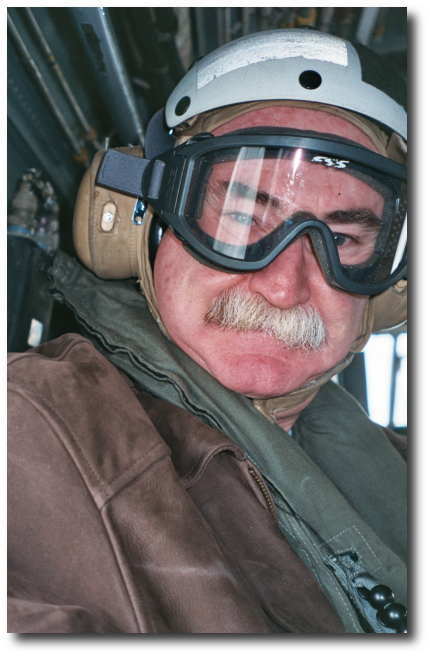 Around 10:00AM, We pulled into Pier-88 alongside the World War II aircraft carrier Intrepid and disembarked before State and local dignitaries arrived for the Arrival ceremony scheduled for around 11:00AM. It was an honor to have been invited to this event and to tour one of the Navy's newest amphibious ships capable of landing a Marine Expeditionary Unit anywhere within reach of airborne and amphibious assets. Some VIPS who were on board included Mayor Bloomberg; the owners of the New York Yankees & New York Jets; Former Secretary of the Navy & Undersecretary of Defense England; and numerous CEOs of major corporations such as L-3 Comm, Tiffany, Merrill Lynch, American Defense Corporation, etc. My thanks to the hospitality shown by the Commanding Officer, Commander Jones, as well as the officers and crew of this warship who went out of their way to make sure we were hosted as only a Navy-Marine Corps team of professionals can do. 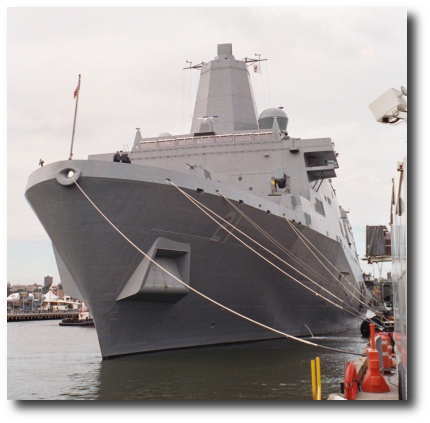 The USS New York Commissioning Committee did an excellent job that eventually culminated with the commissioning on November 7th. My deepest appreciation to them for the invitation and to Michael Kowalski and the Tiffany & Company team in Vienna who sponsored me for this visit. May the ship and those who sail her continue to be manned by the best men and women our nation has as she goes forth as a demonstration of America's might and stalwart commitment to freedom.